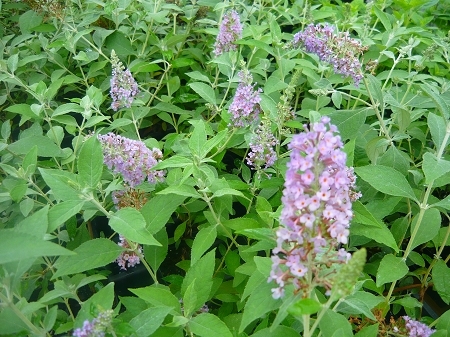 Buddleja Fallowiana x Davidii 'Lochinch' - Butterfly Bush. Also called Summer Lilac. Old fashioned favorite variety. Beautiful blooming semi-evergreen bush features 8"-10" long silver-gray leaves and lavender blue flowers with orange eyes, blooms profusely all summer and fall. Blooms earlier than most buddleja davidiis. The fragrant blooms attract butterflies and hummingbirds to the garden. Old fashioned favorite, quickly grows to a bush up to 10' tall and wide. Likes a sunny location with well-drained soil but will tolerate a variety of soil conditions and is fairly drought tolerant once established. Perrenial zones 7-11. Live plant in 3 inch container.